When Gracie was born she had more shoes than I did. As she was my first I went crazy shopping and ended up with a silly amount of shoes that were never worn as the second she kicked her legs that was it they were off. The amount of times I went to adjust her blanket while out to find we'd lost a shoe meant when I was expecting Zach I didn't bother to buy many shoes. Last week I received the cutest little leather shoes to review from the lovely people at Daisy Roots. Daisy Roots sell a range of leather shoes handmade in the UK for children from newborn up to 4 years old. The shoes are a very reasonable price as they are real leather and the dyes used to colour them are non toxic making them safe for babies who can't keep their feet out of their mouths. 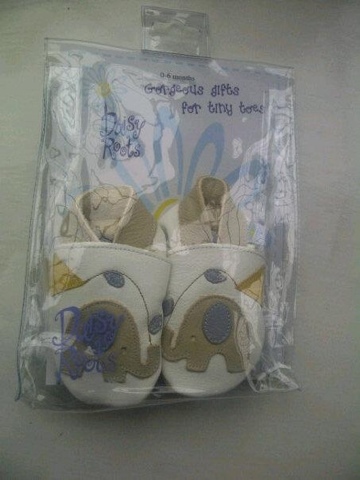 They can also be gift wrapped for an additional £2 making them a great gift for any mummy or expectant mummy friends. I went to look at their website to try and choose a pair which was definitely easier said than done! There are so many beautiful designs to choose from for both girls and boys. In the end I chose the elephant and kite white leather shoes so I don't have to worry about them not matching with any of his clothes. When the shoes arrived they certainly didn't disappoint I pulled them straight out the packet and slipped them straight onto Zach's feet. My first impression of the shoes was that they were lovely, soft and looked very good quality. 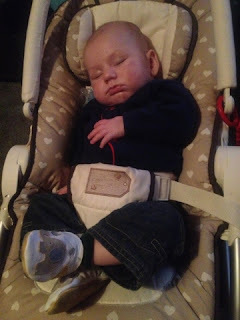 I usually find that shoes that come in 0-6months size don't fit very well but these fit like a glove and best of all they stayed on his feet until I took them off at bedtime without falling off once! show Zach. I think I'll have to buy a big size pair for her to wear as slippers so she'll leave them alone. For more information on Daisy Roots visit http://www.daisy-roots.com/ or you can visit the Daisy Roots (UK) Ltd facebook page. I was sent the shoes free of charge for review but all views and opinions are my own.